A new California state law which will require drivers to stay at least 3-feet away from cyclists will go into effect today. According to a statistic, around 100 cyclists are killed each year from vehicle accidents. The law aims at keeping everyone safe on the road. But how practical is it? ABC7 News in the San Francisco Bay Area, tried to test out the new law. Testers driving a rigged car reportedly found it difficult at most times to stay in their lane while trying to pass a cyclist and staying 3-feet away. The driver was often required to follow the cyclist for long in-city distances, which could lead to congestion problems. 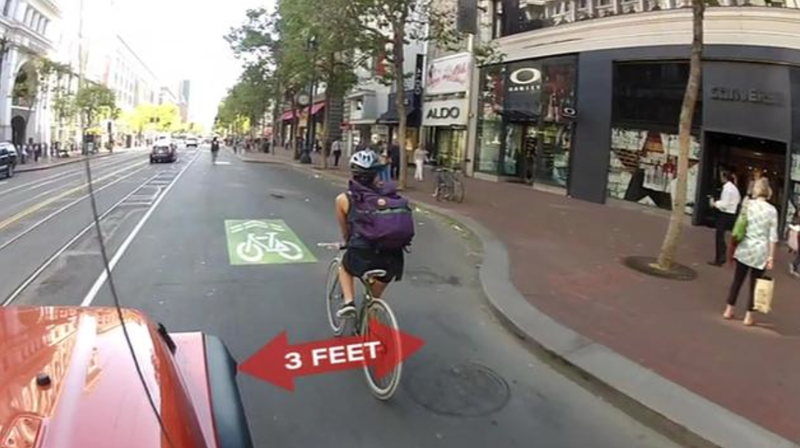 The new law requires drivers to maintain a 3-foot buffer and only pass a cyclist at a speed that is reasonable and prudent. Violators will be fined. With self-driving cars being readied for testing on California roads, it will be interesting to see of provisions for maintaining the 3-foot distance from cyclists are made in the technology. Check out this other report from ABC7 News that looks at whether the new law can be reasonably enforced.